A ridiculously huge amount of equipment of all sorts! Very well illustrated and polished. The expansion this book adds to the game is incredible. The Armory is both much needed AND a very welcome addition, as the core rule book had just enough to be acceptable, in this specific regard, I would say. I can find absolutely no reason not to buy this book. This will give you material to chew on for years to come! Full of much needed gear, guns, armor, and items, the Armory is everything I'd hoped for. This is the book that fills in SO many weapon, armor, and utility holes in the CRB. Juicy equipment for everyone! Low level energy damage weapons! Cool weapons for grappling! Special weapons for different professions! Power Armors with nifty abilities! Grenade scramblers, mimic imagers, holoshrouds, hoverskates, personal phase shifters, hi-tech scopes... it goes on and on and on! When you get this book you realize just how basic and limiting the equipment section in the CRB was. ...I'm pretty sure there's a self shaking stick in here somewhere. Lots of weapons. Okay I was expecting that. But great googley moogley the customization options. Scopes, enchantments, manufacturers, sights, rails, bipods tripods armor mods... there's even office gods. (yes. really) Three different ways to customize a weapon, magic items that can go in armor slots.. my characters have saved up their entire wealth for this moment and I think I'm still short of cash just for the odds and ends. Announced for July! Product image and description are not final. Page count? Hopefully more than 160 for the price. *Crosses fingers for an extra page, paragraph, sidebar, or something that gives a satisfactory answer to why shields and armor work they way they do; i.e., why your shields don't take damage until after your armor has already failed to do its job despite shields being traditionally envisioned as OUTSIDE and IN FRONT OF the armor. It's not a gameplay issue at all; it's a world immersion issue. Just in time for my birthday! Was really hoping for a book like this. So glad its coming out soon. I expect this book to be 160 pages, as it is the same price as the Alien Archive. Also, they redid the Starship skill DCs. Any chance of that appearing in print here? Just for the convenience of having that in print, I mean. Alright! Here come the tech toys! These "isometric" pictures have always been hardcovers. *Hoping for Grav Tanks* I like. Mechs? Or at least better power armor (and not ones that make players rediculous sizes. 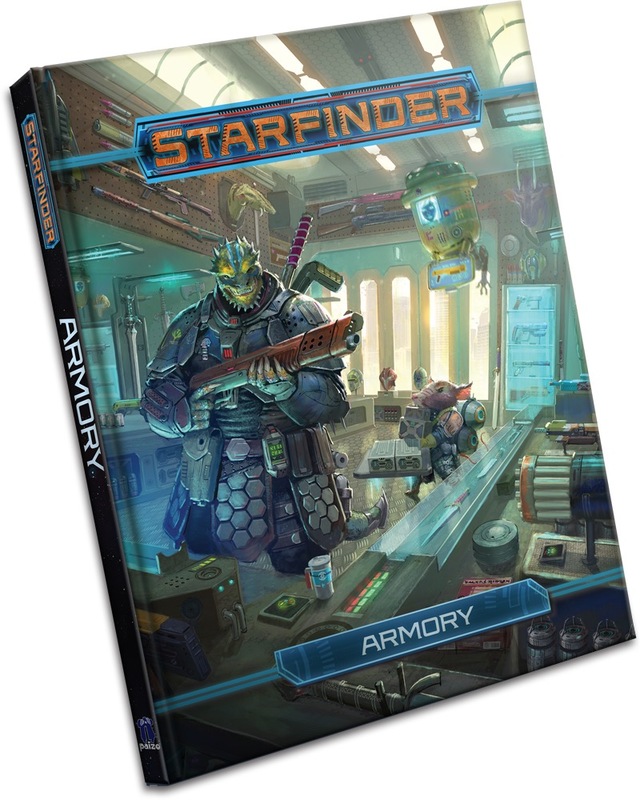 See the Starfinder FAQ here. That's really small for this price though. That will probably go in the CRB reprinting, since it's just some adjusted numbers. What do you think the standard price for modern 160 page hardback RPG books is? to work that out, you can't look at other books of different sizes and try to extrapolate. Find other 160 page hardback full color RPG books printed this yea, and check their price. More weapons? Count me in! The weapon progression was something that kinda bothered me. Unless you're a Solarian, you'd basically be switching back and forth between different weapon styles or elements just to keep up. Here's hoping we can expand that arsenal, not only for more variety, but to also allow me to be thematically consistent while progressing through levels! And as unlikely as this, I am also hoping for something akin to the Shield Weaves from the Phantasy Star Portable/Online series, completely segregating defense from aesthetic. It wouldn't really do much gameplay-wise, but when the only armor that matches your character flavorwise is Defrex Hide, and maybe Second Skin... I say it'd be pretty nice. EIGHT MONTHS! EIGHT WHOLE MONTHS!? Not sure I'm gonna' make it man! Hoping for some equipment that feels more futuristic. Data cloaks, smart ammo, smart grenades, surveillance equipment, etc. I'm also hoping for more light armors with armor upgrade slots. My birthday is the last day of July. I signed on for the main book subscription service. I do hope this means that by the time my birthday rolls around I will have more toys to include in the pre-gens I intend to make for the furry con I will be attending the weekend before Halloween as well as a few things for my ysoki solarion to dream about using in starfinder society. I'm on board for this. I would really like to see a machine, maybe something for your ship, that can break gear back down into UPB's. Since money and UPB's are interchangeable, and literally everything except drugs are made from them, why not just make a device that converts them back? It would make it so a properly outfitted group would never have to worry about going back to town unless they want to. We could definitely use more power armour, given we only have 5 and they all have different niches, making it extremely difficult to make a long-term character focused in it. It would also be interesting if they added some advanced melee weapons with the Operative property. I doubt it will happen because of the damage curve with trick attack. Amen to this! I plan on going into power armor and I'm more a little worried about the gap between level 5 battle harness and the level 10 Spider Suit... It would also be nice to have more "generalist" medium-size power armor options like the battle harness. Spider/Flight are both awesome concepts, but they're also rather specialized and being Large/Huge can be a serious detriment in the wrong campaign. Having to strip down to your Second Skin (TM) because your tank can't fit inside the dungeon is not a good feeling. I'd especially love a level 7 Power Armor. A full BAB character who's serious about his armor can spring for it at 5 (buying a level+2 armor as soon as he qualifies for Power Armor feat) and any character with medium BAB who picks the feat up at level 7 has an equal level armor option available instead of having to settle for the battle harness, an armor that's already two levels below them. I've always wondered about this - is there any point in making suggestions or asking for specific things when a product is announced, or has the content already been decided on and/or written by the time the book shows up on the website? This book will start shipping in ~seven months. At what point is the content locked in? While a book is technically still in flux until we send it to the printer, we generally have the content decided months in advance of that when we outline it and assign it to authors. Suggestions and wish lists, thus, often come after much of a book's work has been done, but that doesn't mean that we couldn't make last-minute changes to get in a particularly vital idea. It's more likely, however, that we'd look to past product threads when outlining future projects in the same vein. There's a reason, after all, that fans generally start a Bestiary request thread long before the next volume in the line has been announced. I need vehicles! Land,sea,and air. Can I get bikes and skates and skateboards. Fine spaceships and more guns. Would be interesting to get formulas to generate armour/weapons/vehicles to make up the missing levels for things. Operatives need to spend a feat to get advanced melee weapons. Others are likely to be interested in Operative weapons and some of them (such as ranged Solarians) would have the proficiency and are likely to have a better Dex than Strength. That plus I find it hard to believe in a world with Technomancers and such, you wouldn’t get someone making a plasma dagger or something like that. Once the blueprint is available, anyone with the UPBs and skill could craft one. Sometimes we find that, as a result of how the art and text flow, we need to add 500 words to a section at the last minute, in which case knowing everyone desperately wants star-halfling cyber-muffins is really useful. Other times we read these threads and think "If only the book hadn't;t already shipped to the printer." usually we're somewhere between those two extremes. But what can't change on a dime is things like how big a book is. When scheduling the workflow, we need start and end dates not just for writing, but development, editing, art and map orders, layout, and so on. And those dates can't be before the previous books are done, and cannot push back when alter things on the schedule happen 9and there's never just one book going through the pipeline). So even if everyone agrees six months before a release date that it's be better if a book was 64 pages longer, the schedule just can't accommodate that without pushing back everything, including products in unrelated lines that have subscribers ex-ecting monthly (or bi-monthly, or quarterly) products. And while we try to build in slack, we NEED that for when some disaster strikes, like play testing discovering a whole subsystem is broken in a very specific way very late in the process. We can, of course, make books SMALLER, but no one ever seems to advocate for that. You can already break items down for their UPB (10%). The issue is that it doesn't say how or how long it takes to do so. 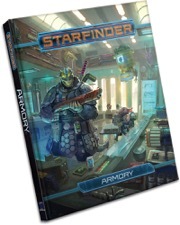 Reading between the lines here, and feel free to ignore this because I'm fishing shamelessly: Have there been any discussion on or plans to make larger Starfinder AP/rules books in the future...? I'm hoping for the sum of these two. Really wanting to make a Ysoki that rides a medium sized hover bike but I have no idea how to upgrade the crummy Goblin Junkcycle at the moment as I level. Well, there is the Inferno Knife, page 12 of Dead Suns volume 2. Not quite a plasma knife but halfway there and with the Operative tag. Since the blurb mentions its needless complexity yet it is still classified as basic melee, I could see a plasma knife being spec'd the same. Oh man I CAN"T WAIT. I like the sound of smart grenades and smart ammo. Something like remote controlled rockets or explosive devices, all of this would be short range, like within 200 feet. Maybe a shield that can collapse into a gauntlet and then on command unfold. Like a heavy shield equivalent in pathfinder. Maybe this is too much but maybe some modules that can enhance the AI of the mechanics cortex. Now I am fishing, unless I missed it somewhere, what is the plan for Player companion equivalent in Starfinder? So far no Player Companions are planned for SF. But there will be 3 hardcovers every year it seems (one of them an Alin Archive), which personally i like much better than a monthly PC, because it gives the developers more time to collect ideas and fine-tune them than a monthly book. At 160 (Alien Archives)-216 (Pact Worlds) pages for $45 it is also the size of 5-6 Player Companions at the price of only three. This looks interesting. Curious what will all be inside and how weapons will develop. And if there will be spells perhaps. Hoping for more operative weapons! I was just curious. I really hate the Player Companions. Would rather them not do it. But some time into the books and make them worth the money. And for content to be totally worth it. Many. And there will be more. We nearly have that conversation anew every time we schedule a new hardback. (Softbacks tend to be more standardized sizes, though we also periodically investigate if those make sense at their current size). Very little is done here without some thought (and often a meeting or two) going into it. However looking at things and discussing them often can't overcome the factors that caused the original decision to get made, and there's no point in constantly declaring "We thought about changing something... but we're not going to," so many things look unconsidered and monolithic from the outside, despite us reviewing and reconsidering and analyzing on a regular basis. Very excited about this. I'm a gear junky, I have problem. To throw in my $.02, I love Starfinder's increased focus on hardcovers over more frequent softcover material like the player companions. I feel confident that the material will be kept up to date with FAQs and erratas, and I don't feel as overwhelmed as I did when I initially tried to keep up with the Pathfinder publishing schedule and was bombarded by bi-weekly releases. However I really wouldn't mind seeing more pages added to the SF hardcovers. Alien Archives is a great book but it feels a little light, especially if you compare it to the first bestiary. I'm also a little concerned that my groups seems to be going through Dead Suns books faster than they're being released. I've picked up the first book of Legendary Planet as a backup in case we run into a "gap month", but I'm less than thrilled with the idea of putting Dead Suns on hold - in my experience players tend to get excited about their new character concepts, then the old game goes on the back burner or dies off. If there's one thing I have to have in a book like this is would be formula to create content that feel is missing.